Show a bit of foresight and create a list of things you want to do before you leave your job as a CIO. We all are aware that the average time a CIO spends in a role is 3 to 4 years. Of course, there are exceptions but often, a CIO has done what he or she needs to do by the time year 4 rolls around. Given that it’s likely that it won’t be an overly long stay, it’s always good to have a ‘bucket list’ prepared of tasks that you must complete during your time in the role. The CIO ‘bucket list’ will vary according to the experience of the respective executive, and not having one shows a lack of foresight and perspective. It is also just good career management. Take the time to help talented individuals build the capability they need to succeed. This may be immediate or in the next generation but you have developed leaders who can learn from your own approach and eventually become a CIO. In every place that I have worked I have seen examples of staff that have been written off by their supervisors or peers. As a CIO, one of the most rewarding aspects is to identify who has been wrongly classified. I recall a number of such persons and indeed one person who is now a CIO but was considered to be not of that caliber. It’s an incredible privilege to get given the opportunity to be a leader in different industries and countries. There is reward for yourself in learning about new cultures and business models, which enrich you and make you a better leader. Every CIO will have stories of examples of poor behaviour from colleagues, supervisors and peers. In some cases this is directed against yourself or your team members. It is easy to be caught in the moment and react, but try the harder path to be ‘zen’. Forgive them for their poor judgments and move on - actually it is hard but it helps you as well. There are multiple ways that you can help others and traditionally this has been to mentor new talents and potential CIOs. Another option that you can try is to be an advisor or mentor for an innovative startup. This is not about monetary reward but that you are actually really kick starting someone else’s life. Seek comfort from uncomfort, when things are too simple and easy then you can’t be doing your job. In fact you are threatening the legacy that you so dearly want to leave. Be comfortable by being uncomfortable; in other words, break out of your comfort zone. You need to do this if you want to lead a team of true change agents. Your personal health matters and being able to disconnect is an incredibly healthy sign. This is not about the work-life balance as we all know that is always out of kilter. Instead be mindful of the need to make healthy choices – don’t ever skip lunch or forget to take that break you desperately need. If you don’t put your health first, your work will suffer. Have the courage to always do what is right, not what you think others want of you. That is really being a leader and having the courage of your own convictions. When you take this path, you will always be able to use integrity as your compass. So it’s now over to you. 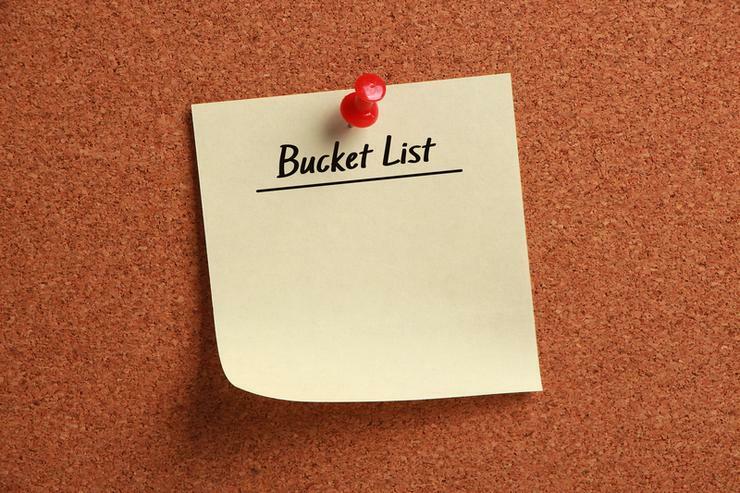 8 items on your bucket list is a good start – see if you can think of two more to make it ten!